The prolific rapper has more material waiting to be released. Ever since announcing his upcoming Jeffery mixtape about a week ago, Young Thug has been steadily dropping snippets of the project on his Instagram. Each clip features a sneak preview of one of the tracks along with footage from Thugger's everyday life: Thug driving around, getting a pedicure, or showing off his ice. 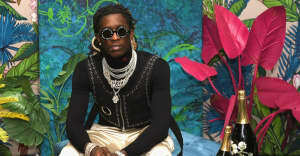 Jeffery still has no formal release date, making it another project that Thug has promised to drop along with I Came From Nothing 4 and his long-awaited studio album, Hy!£UN35​. If Jeffery is released before the end of this year, it will be the Young Thug's third project of 2016, following I’m Up and Slime Season 3. Watch snippets of Jeffrey via Young Thug's Instagram below (from most recent to oldest) and revisit his FADER cover story here.